There’s a reason why the Jeep brand has a cult following. Old Jeeps are some of the coolest vehicles ever made, and the history behind the brand is just epic. But some Jeeps don’t get the recognition they deserve. Let’s look at some rare old Jeeps that history forgot. Let’s look at seven rare production Jeeps: one per grille slot. Wrangler, Cherokee, Grand Cherokee, CJ- these names rush to our minds when we think “Jeep.” But there are so many other great vehicles that sported that Jeep badge over the years. Many of them were military vehicles, some were mail delivery trucks, others were ambulances. While these vehicles have seen use in a variety of disparate environments, old Jeeps all share one common trait: they drip with soul and character. Here are seven awesome production Jeeps that you may or may not have heard of. The Jeep CJ-6 was Kaiser’s response to customer’s needs for a roomier offroad vehicle. The CJ-6 is simply a Jeep CJ-5 with an extra 20 inches of wheelbase. Sounds like a winning formula given the success of today’s Wrangler Unlimited, but the CJ-6 didn’t do so well in the marketplace. Debuted in 1955 for the 1956 model year, the CJ-6 was a sluggish seller. Even though it had the mighty “Dauntless” V6 engine and an AMC 304 V8 in its later production years, only about 50,000 CJ-6s were sold in a 20 year run. Some were sold in South America, where some were converted to 4-doors, while quite a few made their way to Sweden. In America, CJ-6s were used by the forest service, but not many were sold to regular customers, though we know for sure that one ended up on the ranch of President Ronald Reagan. There was also a military version of the CJ-6 called the M170. It was built three years before the CJ-6, so it might be more accurate to call the CJ-6 the civilian version of the M170. The M170 was basically the same as an M38A1, a military spec CJ-5, except it had it was stretched 20 inches. Most M170s were used as ambulances or light troop carriers. One of the many differences between the M170 and the CJ-6 is the M170’s interior-mounted spare tire, which allowed stretchers to hang out of the back. You can read more about the Jeep CJ-6 here. Oh, the ugly duckling. 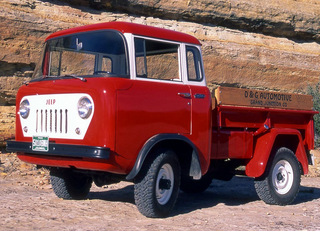 The Jeep CJ-10 was based on the glorious Jeep J10 pickup. It was sold mostly to international markets, especially to Australia, where it was called the “1 Tonner.” Its fender-mounted square headlights and strange ten-slot grille made it among the least aesthetically pleasing Jeeps ever built. But who cares? You could get it with a soft top! Yes, folks, a convertible pickup truck. There is a car god. CJ-10s came with either a 4.2L AMC inline 6 (the grandfather of the legendary 4 liter), a 2.5L AMC 4-pot, or a 3.2L Nissan-built diesel. Transmission options were taken from the J truck line: either a 4 speed manual or a 3 speed auto were available. There was also a version of the CJ-10 called the CJ-10A. Only about 2,000 were built, but these Mexican-built aircraft tugs served duty in the U.S. airforce in the mid 1980s. It was a funny looking little Jeep- have a look below. The DJ, which stood for “Dispatcher Jeep,” debuted in 1955 as a modified CJ-3A. It featured a 3-speed manual (either column or floor mounted), and an L-Head Hurricane 4 cylinder engine made famous by that ol’ World War 2 Willys MB. The DJ saw use by a variety of delivery companies, especially the United States Postal Service. It could be had in either hard top or soft top form, and was one of the most versatile little cargo hauler of its day. Probably the most recognizable DJ, though, is the DJ-5 Dispatcher, which came in some very cool U.S. Mail livery. DJ-5s aren’t nearly as rare as early Jeep DJs, and can still be found on the road today, as our guy Mr. Ballaban has shown. One loony version of the DJ was called the “Jeep Surrey.” It was basically a DJ that had been outfitted for use at hotel resorts. It came in either blue, pink, or green, and featured a decorated soft top, striped seats, and painted wheels. When you hear “FJ,” you naturally think about the old Toyota FJ40s from the 60s. But hold on there pal, because Jeep sold their own FJ from 1961 to 1975. Not quite an offroader like the Toyota, the FJ “Fleetvan” was the Ford Transit Connect of its day: a stubby little cargo delivery van. It was based on the DJ-3A dispatcher, and was sold by Willys-Overland and Kaiser-Jeep primarily to the U.S. Postal Service. The early models were called FJ-3s and FJ-3As, with the 3A being the longer version of the two. The FJ-3 stuck around for a few years until a new CJ-6-based FJ-6 replaced it in the mid ‘60s. The FJ-6 was then replaced by the FJ-9 near the end of the FJ’s production run around 1975. All FJ Fleetvans came with the F-Head Hurricane engine and either a 3-speed manual or 3-speed automatic. The Jeep Forward Control, also called the FC, is probably the quirkiest looking Jeep of all time. It was designed by Brooks Stevens in the early 1950s with inspiration from cab-over designs found on full-size trucks of that era. The FC launched for the 1956 model year and used modified CJ-5 underpinnings. There were three engine options: the venerable Hurricane inline four, the 226 cubic inch L-head inline six, or a 318 cubic inch V8. These engines could be mated to either a three speed manual, a four speed manual, or a three speed automatic. FCs came in lots of forms. There was the FC150, with an 81 inch wheelbase and the longer, more popular FC170 with a 103 inch wheelbase. There were tons of variations of these two vehicles: fire trucks, vans, ambulances, tow trucks, deliver vehicles, and lots more. And then there were military versions. The M677 was a four door crew cab FC, the M678 was a van, and the M679 was an ambulance. Kaiser Jeep introduced the Jeepster Commando in 1966 to fight off competition from the International Scout and Ford Bronco. It was actually a pretty versatile vehicle, as it could be configured as a convertible, pickup truck, wagon, and roadster. The first generation, shown above, could be had with either an F-Head Hurricane four cylinder engine or Buick’s Dauntless V6. Then, for the 1972 model year, the Commando got AMC’d. American Motors Corporation got rid of the name “Jeepster,” and renamed it simply the “Jeep Commando.” They added a revised, questionable looking full-width grille and extended the wheelbase a few inches to accommodate two inline-6 offerings and a 304 cubic inch V8. The revised model, shown below, only lasted two model years. The Kaiser Jeep M715 was a military truck based on the Jeep Gladiator truck platform. It came about due to prohibitively high costs of the Dodge M37, the go-to military truck at the time. The M715 came with an overhead cam 238 cubic inch inline 6 engine and a 4 speed manual transmission. The M715 was convertible, had a foldable windscreen, and used many civilian SJ platform components to keep costs down. Over 30,000 were built in Toledo between 1967 and 1969. Also called the “Seep” for “Seagoing Jeep,” the Ford GPA took the WW2 Ford GPW (very similar to the Willys MB) and outfitted it to float over rivers and lakes. Built between 1942 and 1943, the GPA was designed by Roderick Stephens, a yacht designer who was tasked by the U.S. military to come up with a quarter ton vehicle that could transport troops from ships to shore and overcome bombed-out bridges by simply traversing waterways. The GPA’s name might indicate that it was an intelligent, capable vehicle, but not so. It tried to make do with the venerable Go Devil four cylinder engine found in all WW2 Jeeps. Unfortunately, the GPA was much heavier than the GPW and MB WW2 Jeeps. The GPA was slow, and often got stuck where the Ford GPW or Willys MB plowed right through. In water, it was unstable and unable to carry much payload, so it really couldn’t comfortably carry soldiers to shore. Ultimately, the GPA was a flop, and production halted at about 13,000. You can read more about the Ford GPA on Jeepcollection’s website.